The Tag Heuer WJF211B.BA0570 brings to mind the word ‘heirloom’. There is something about the styling of the face that reminds me of a grandfather clock. I can’t say what it is as I don’t recall ever seeing a grandfather clock with pinstripes. It might be the lovely muted colour, or it might be the secondary hand sweeping off the seconds at the six o’ clock position. Speaking of the secondary hand, I love the positioning, and that the date cut out repeats the placement recursively at the six o’ clock position of both the secondary face and the primary face. The construction is fairly typical of this price point. The watch is faced with scratch resistant sapphire crystal. The housing is stainless steel. The bracelet is also stainless steel. The primary hands and markers are steel inset with luminous markings. The only numbers are on the secondary face, marking off the seconds, and the date. 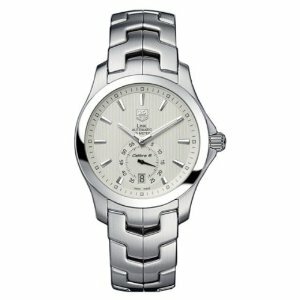 As is common to the Tag Heuer line, the timepiece features automatic movement. The watch also features on of my favorite Tag Heuer features, a window on the back to observe a portion of the internal clockworks. The distinguishing feature of the watch is the links of the bracelet. At first glance they appear to be arrow shaped, but closer inspection reveals they are shaped like the z-shaped Tetris pieces that always mess up a good run. I’m also not a fan of the line created where they come together. It would have been a much more attractive bracelet if the links had been solid and arrow shaped as they first appeared. The colour of the face, while very complementary to the rest of the steel construction, doesn’t offer much contrast for reading the primary hands. The easiest to read portion of the watch are the largest and smallest increments of time being offered: The date, and the seconds. Perhaps the reason this watch makes me think of an heirloom is because at a certain age, you would hand it off to your son whose younger eyes would be more up to the task, while you track down a watch with higher contrast.